American Idol, Season 10: Who Will Win? Tonight is the night, is the night of love. 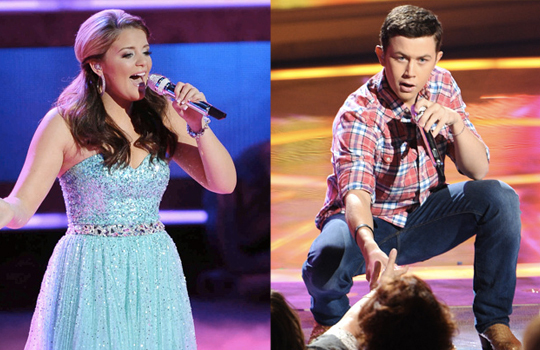 Well, maybe not, but it is the night when either Lauren Alaina or Scotty McCreery will be showered in endless confetti after being crowned the Season 10 champion of American Idol. I didn't really hide the fact that I was pushing for Haley to make the finale and ultimately win (and, yes, I'm aware that it was all a huge departure from my feelings before the Top 24 when I loathed Ms. Reinhart), but the dark horse still made a great showing, ending her run in third place. Not only did this mean my fantasy finale remained just that, but it also meant that last night's performance finale was one of the most dull and predictable in Idol history. Two country teens who haven't done much in way of "taking a risk" this season pretty much kept that trend going, singing nice yet unmemorable songs in their wheelhouse. But ultimately, one of these youngsters needs to join the ranks of Kelly, Ruben, Fantasia, Carrie, Taylor (ugh), Jordin, David, Kris and Lee (ugh). So who do I think it will be....? I have to give the edge to Lauren Alaina. Since Pia's shocking elimination all those weeks ago, I'd been resigned to the fact that Scotty was going to walk away with this one. And up until last night's finale, I was still convinced that Mr. Baby Lock Them Doors would be the champion. Heck, even through the first two rounds last night I still thought Scotty had it in the bag. At that point, neither Scotty nor Lauren had delivered a winning performance and although Lauren looked to be trying hard, her vocals just weren't delivering. Scotty, on the other hand, was practically phoning in his performances, just another clone of all the others we've seen over the course of the competition, which obviously had been enough in the past. And then came Round 3. Scotty's future single was, again, pretty bland (what was it even about again? "Love this big"...?). A perfectly nice (ew) song. There was no vulnerability, no real passion behind the notes. Dear Randy Jackson, I didn't really feel like I was at a Scotty concert, or at least one worth attending. Then out came Little Lauren, who had one last trick up her sleeve in the form of a future single all about her wonderful mother. Um, hello?! Call this a cheap ploy, call it pandering for votes. I call it brilliant. It's the one song I remember from last night, it was a sweet and beautiful moment for her, and she really delivered the goods when it came to the vocals. If America was as bored to tears as I was until then, that song surely woke us all up. When it comes to Lauren, I will always contend that she peaked at her audition when she sang "I Don't Wanna Miss a Thing" with Steven Tyler. Throughout the course of the competition she appeared to lose confidence and the vocal prowess she showed that day, but that final song was something worth remembering, worth voting for and worth winning the title of American Idol. Who do you think will be crowned tonight? Vote in the poll below and go on a rant in the comments! Family Jules: Ew. It's Merlot.